When it comes to patient care, both nurses and physicians are crucial to the delivery of positive medical outcomes. In terms of the relationship between the members of nursing and medical teams, seamless cooperation and communication are what make the team approach truly successful. Thus, the nurturing of positive nurse-physician relationships is central to the earnest pursuit of high-level teamwork and results. In simplistic terms, poor relations between nurses and their physician colleagues can either be strengthened with respect or derailed by disrespect. While a certain unavoidable stratification exists between bedside nurses and physicians based on levels of education, experience, or responsibility, stratification also exists between physicians and Advanced Practice Registered Nurses (APRNs), especially where APRN practice authority is limited. Despite such differences, both nurses and doctors bring specific expertise to the table, and no matter how those areas of expertise differ, their importance is equal in terms of the ultimate goal of superlative patient outcomes. When nurses and physicians can find common ground, mutual respect, and an appreciation for all team members’ crucial contributions, everyone benefits. Moving away from top-down hierarchical relationships towards a more egalitarian model can certainly move the needle in terms of supportive, productive relationships. Kind, respectful communication is key to smooth clinical operations, as well as the development of strong interpersonal bonds and mutual respect. When groups of staff members wall themselves off into silos and opposing camps, precious little can be accomplished. However, when effective communication is modeled and practiced, that is where the magic can happen. Even for those who are less than sensitive to body language and other signals of communication, conversational and listening skills can be improved with practice. Aberrant behaviors that are a scourge on our teams and can destroy workplace culture and relationships include bullying, harassment, intimidation, and discrimination. Many organizational leaders turn a blind eye to nurses who bully other nurses, as well as physicians reported to have bullied nurses and other staff members. Bullying undermines workplace culture, instills fear in certain staff members, and raises questions about organizational priorities when bullies are allowed free reign. Physicians’ position and responsibility as powerful revenue generators should not preclude their being disciplined for on-the-job misbehavior, yet this is anecdotally common. And when nurse bullies also run amok, wreaking havoc in their wake, culture breaks down and unhappy employees and dysfunctional teams result. We need the leaders of healthcare organizations to lead the charge in terms of positive communication, teamwork, and the fostering of individual and collective relationships that encourage nurses and physicians to see the value of working closely and respectfully together. Teams cannot necessarily be left to their own devices to find the way to good relations. Trainings, in-services, and enlightened leadership can bring team members together and cultivate improved communication through a number of inspired interventions. Employees’ emotional and relational intelligence can be improved with education and support. Active listening and other communication skills can be taught, including the ability to read body language and other social cues. Organizations must also assertively address issues related to group dynamics, especially the aspects that may lead to communication breakdown and the development of enmity and bad blood. While individual employees can work hard to influence communication and interpersonal dynamics, one person cannot generally change an organization singlehandedly. Rather, it takes a village to defeat negativity, and when everyone is on board, the goal is that much more achievable. 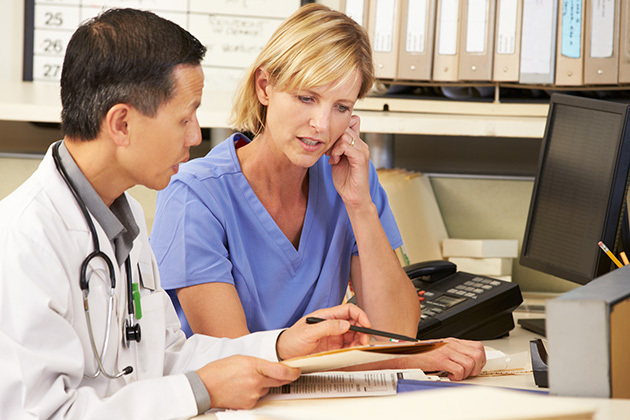 Positive relationships between nurses and physicians is paramount for organizational success. Who in your institution will lead the way and champion this crucial aspect of optimizing our most precious healthcare human resources? Keith Carlson, RN, BSN, NC-BC, has been a nurse since 1996. He is the blogger behind the award-winning blog, Digital Doorway, a widely read freelance nurse writer, and motivational/keynote speaker. Keith is the host of The Nurse Keith Show, a popular nursing career podcast. Under the auspices of Nurse Keith Coaching, Keith's passion is helping nurses and healthcare professionals create ultimate satisfaction in both their personal and professional lives.